Increased hip rotation (through knees & ankles). Increased torso rotation (through extension of the spine). Increased arm elevation (through the shoulders) & "set" of the wrists. Understanding Power Sources Power sources have a big effect on which clubs you'll favor, and what level of consistency you'll potentially face. Power Sources - Pros Vs Ams In this video, I walk you through the common ways that golfers create speed and how professionals and amateurs do it differently. Losing Distance - What Questions To Ask Yourself When you suddenly lose a lot of distance, here's a checklist to walk yourself through. Power Sources Learn some of the common power sources for creating speed in the golf swing. 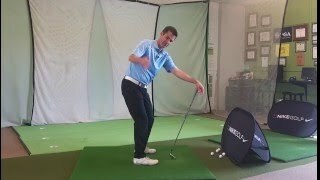 Moves Of Power Learn how to maximize the movements in your swing for power, and decide if it's worth making the swing change.